I’m a former Brussels-Sprouts HATER. H-A-T-E-R.
Just the smell makes me feel sick. I’ve had them prepared deliciously for me at a few local restaurants (mainly because they’re roasted, covered in butter, bacon, and blue cheese), but haven’t ever wanted to cook them myself. I’ve tried a few different times and y’all, at one point I threw the entire bag out on the back porch because the smell was SO BAD. I recently decided to try again and they were so good, I’ve now started making them twice a week…even my kids will eat them! I took a super popular recipe and just simplified it a bit (and made it a little healthier). 1. 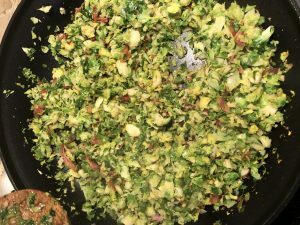 Dump your sprouts into a food processor and let it chop/shred them. This won’t take more than about 5-10 seconds. 2. Chop up your bacon into smaller pieces (I use kitchen scissors for this), then brown it in a large skillet. 3. Once the bacon is done, remove the bacon pieces and then discard some of the bacon grease that will be left over. I know- it’s delicious and you want it all, but the truth is you just don’t need that much bacon grease to enjoy eating these Brussels sprouts. I promise. 4. Once the bacon is out and part of the great, add in some onion and garlic and cook briefly. 5. Add in the shredded sprouts and cook through. This won’t take too long. Once it’s done, add the cooked bacon pieces back in and stir. SO GOOD. I’m not even exaggerating. Today I made them for a Saturday morning breakfast. What? Who am I?!? !